STARKVILLE, Miss. -- March is a good time for landowners to take steps to prevent wildfires, not only because it is Wildfire Prevention Month, but also because more fires occur this month. Heather Alexander, an assistant professor in the Mississippi State University Forest and Wildlife Research Center, said March sees more wildfires than summer months because it is a time of transition between winter and spring. "At this time of year, winds are high and fuels are dry," she said. The Mississippi Forestry Commission suppressed 2,318 wildfires in 2017. Those fires burned 33,574 acres and threatened 4,474 structures, 4,441 of which were saved. About 90 percent of those fires were started by people. John Kushla, professor and forestry specialist with the MSU Extension Service, said keeping fuel loads low reduces a wildfire’s chance of spreading. Fuel loads are the flammable materials fire could consume. The most important step timberland managers can take is scheduling regular, prescribed burns. These controlled fires greatly reduce fuel loads in forests and benefit wildlife. “Prescribed burns help manage unwanted vegetation, improve access into the stand and enhance wildlife habitat,” Kushla said. “Wildlife species will respond differently to the frequency and intensity of prescribed burning. When using prescribed fire for a wildlife habitat objective, conduct understory burning only during the winter. Many wildlife species breed in the spring, and a prescribed burn at this time could be counterproductive to wildlife populations. 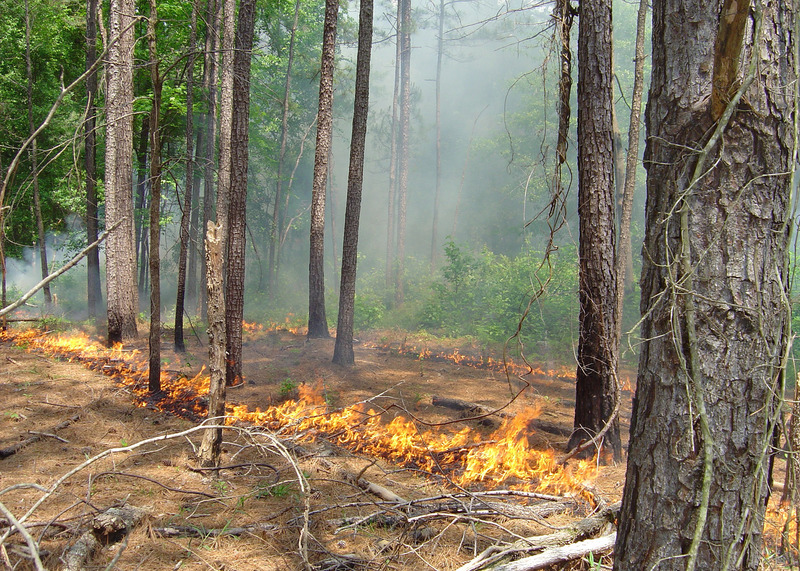 An additional use for prescribed burning is for landowners who sell pine straw. Scheduled fires also reduce unwanted vegetation. People have no control over some elements that contribute to wildfires, such as dry, windy days. However, more often than not, human error and neglect are factors. Campers also have a part to play. Keep campfires small and clear of nearby vegetation that could catch fire. Burn only natural materials and not rubber or plastic. Building with fire-retardant designs and materials, keeping roofs and gutters clean of fallen leaves and pine needles, and maintaining watered and mowed lawns are just a few basic ways people who live near forestland can protect their homes from being damaged by wildfires. The Mississippi Forestry Commission offers a Firewise educational program to help homeowners and community leaders understand how to protect homes and communities from wildfires. This program offers tips on design, construction and landscaping techniques. For more information, visit http://mfc.ms.gov/forest-protection/firewise.